Thomas is a wonderful Guy who plays the Bass guitar with great efficiency. I met him in a prayer fellowship last year. Similar experiences in our past and similarities in our behavior made us instant mates. 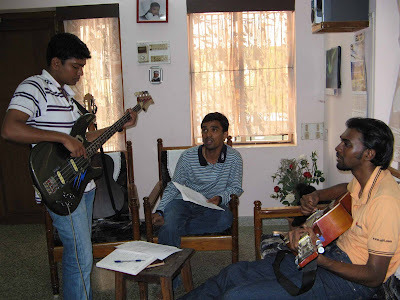 When we floated the idea of starting a new band, Thomas gave me lot of ideas and finally we have a band and we have indeed started performing. Thomas is working as a Quality Analyst in a very well known IT firm. Jeremy is the pillar of December Radio. He romances with the strings. It is indeed a treat to watch him play the six strings. When I first saw him a year back, he appeared to me as the Indianised version of Slash; with his long hair and chiseled looks. He works as a software Engineer. Now the long hair has disappeared. 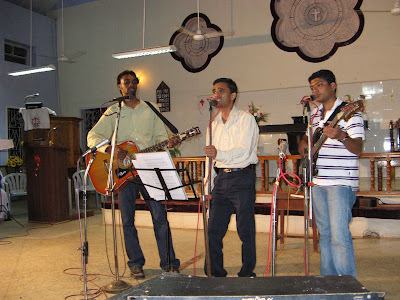 Our first performance took place in the church where I worship on Dec-02-2007. It was also the same day that Revelational Raagaa was supposed to do its first performance. December Radio was indeed a blessing in disguise for us and acted as the best answer for the RR mishap.Our voices matched well and the accompaniments synched well too. The song we selected for the performance was “Saviour’s Day”. Glory, Honor and praise be ye to GOD alone. Good Luck to December Radio. I came to your blog through your orkut account.I saw your performance in Church for the carols service and our team has become your instant fans.We are still talking about your expressions and your rocking voice. When is your next performance? Good luck for the 25.12 FM. So beautiful words.. Good luck and have fun!! well thank you very much. and i know you machi. so no more pranks on me. we need ta pracise more..
welkum to my blog. thank you for the wishes and yea, very gud words. All the best man, havent seen u by my page lately?? We are doing Saviour's day for carol nite in our church. Like the arrangement for it. Heard the Cliff Richard's version. All the best with your band !! !